It may be a Costa now, but it has far more daytime customers now than it had when it was a pub. Yet another pub hits the dust - went into Sidmouth yesterday for a pint in the Ship to find it's now a Costa. I am extremely sorry to say that this lovely old pub, which has always had a wonderful atmosphere, has been sold and will shortly be reopened as a Costa Coffee. R.I.P. 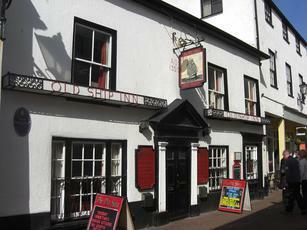 The Old Ship Inn. You will be sorely missed.